PostcodePast – discovering heritage content in a world without ubiquitous geotags! PostcodePast grew out of a realisation that just the tiniest percentage of location specific content is geotagged, and sets out to do something about that. Working at Europeana and supporting hackathons, one of the commonest ideas from participants was “let’s build a map”. The problem then was finding good, accurately geotagged content. Projects like Historypin rely on users placing content on a map during the upload process, whilst others like Ajapaik have set out to solve the same problem by asking users to ‘pin’ sets of content, with great success. But it’s really hard to get that to scale, both geographically and especially by volume, with content spread across so may different sources. At the same time, often descriptive metadata is available that allows at least some sense of location to be derived. Europeana has used to achieve some success with it’s own semantic enrichment tools but this still relies on the data being supplied in a suitable form. 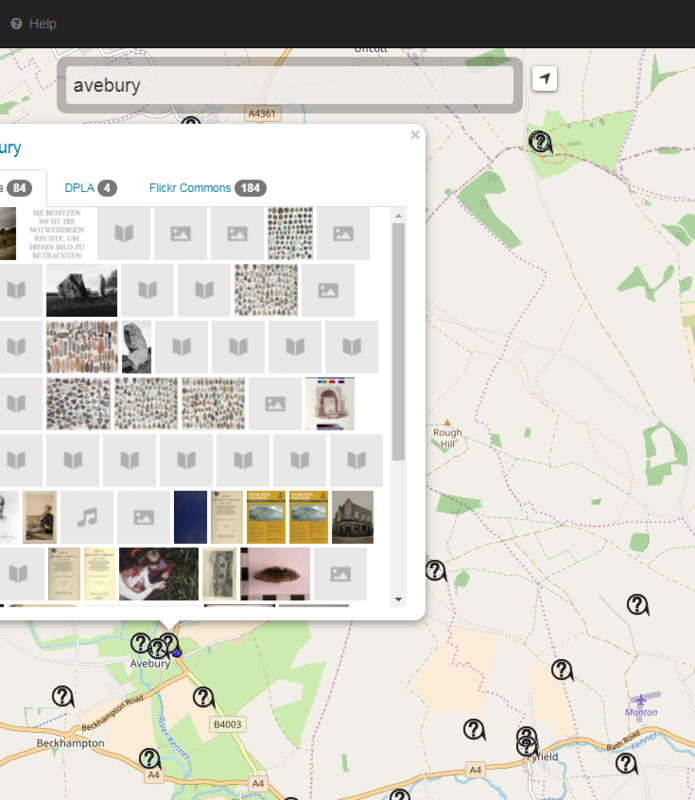 The idea behind PostcodePast was to experiment with a far more abstract form of content discovery, allowing a user to navigate to a location and then displaying places of interest that are likely to have content in cultural heritage content and allowing them to search for these across multiple sources. To achieve this Wikipedia was used to display such notable places (this was built essentially before Wikidata was a thing). When a user clicks any placemark content is looked up based on a simple but broad reaching text search in Flickr Commons, Europeana, and DPLA – it would be quite easy to add more sources, but where do you stop? I’d rather everyone just provided their data to aggregators! Once found, users then have the option to confirm locations, refine them by moving the placemarker, or indeed reject the location. This part needs some refinement from a UI guru, but as a proof of concept it seems to work. The idea would then be that the crowdsourced data could be opened up, including for use by the providers to improve their original records.